The Fort from Nevis Landscape Partnership on Vimeo. I’m delighted to share a film we shot last summer for the Nevis Landscape Partnership, and premiered at the Fort William Mountain Festival last month. It’s my first archaeology film! The Iron Age fort of Dun Deardail in Glen Nevis always caught my eye when walking off the summit of Ben Nevis after a winter climb. 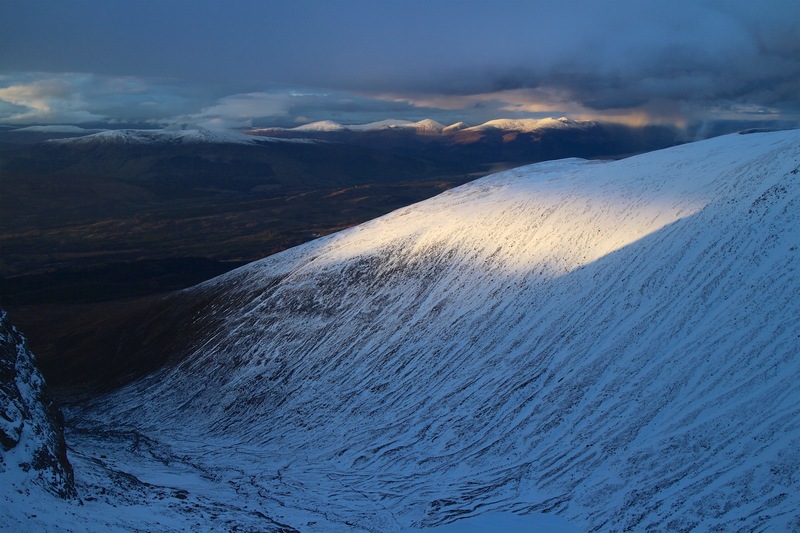 It’s striking ring-like remains on the summit of a conical hill across the glen always catches the late afternoon sun. I always resolved to find out more about the fort but never did. So it was great to hear that the Nevis Landscape Partnership had arranged a three-year project to excavate the fort for the first time, and that myself and Claire would be filming it this year. I’m always fascinated to learn something about scientific disciplines I know little about and the archaeologists I interviewed during the excavation were great to listen to and really opened my mind to think about the themes of archaeology in general, and get a better vision of life in Glen Nevis thousands of years ago. Enjoy the film. Ben Nevis : The Hidden Side from Nevis Landscape Partnership on Vimeo. Ben Nevis · Wild Times from Nevis Landscape Partnership on Vimeo. Nineteen Projects from Nevis Landscape Partnership on Vimeo. I've been meaning to prepare a topo of the Arisaig Cave for ages. I've also made a PDF version of it here if you want to print it and take it with you. Enjoy! 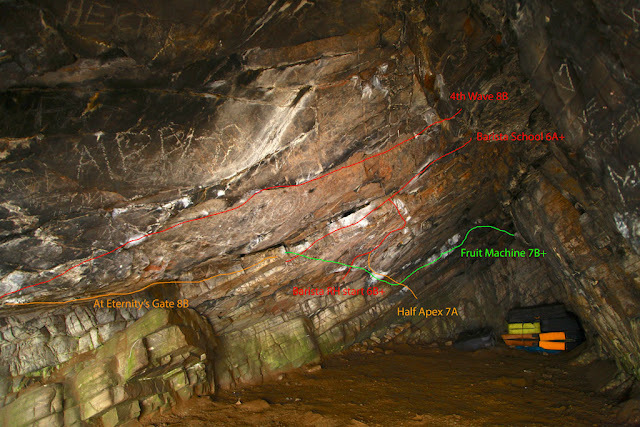 The cave offers a weatherproof medium-hard bouldering venue that is in good condition for at least 6 months of the year. 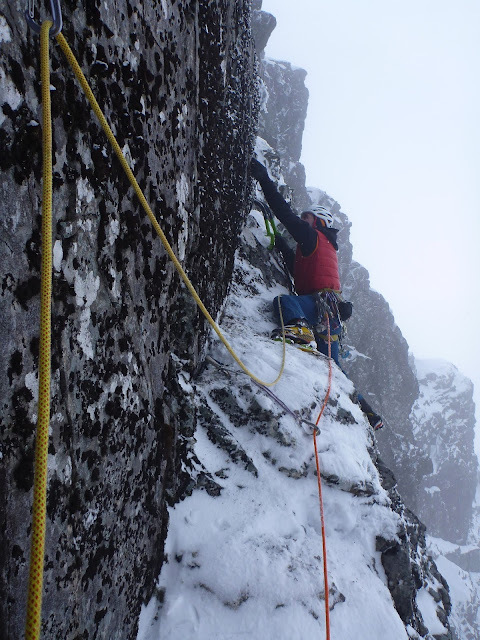 In the dark Lochaber months from October until February, it can often be the only outdoor rock climbing on offer, at least on the wettest days. 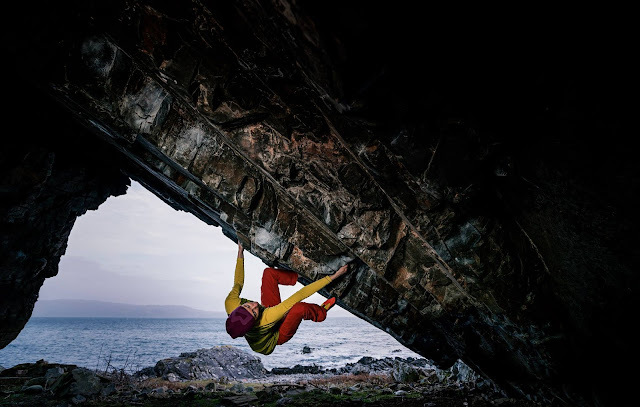 There are not a huge humber of climbs, but the ones that are there are good quality, generally long and involved and so provide good entertainment. I opened the first problems in 2009 and still have not quite climbed all the obvious lines. Most of the problems were opened by me and have not had many repeats so the grades may still need adjustment. The rock is quartzite, relatively kind on the skin, but the climbing is generally powerful and gives a good workout. All of the steep climbs are also sequency and reward a persistent approach, seeking out the crucial toe-hooks, kneebars etc. Although all the climbs in the cave are totally protected from the rain and there are almost no seeps either, the conditions can be affected by the weather sometimes. If the conditions have been cold and then warm up, the cave can be damp for a day or two with condensation. This is generally not too often, but watch the weather and just avoid going right after a warm front has passed through. Otherwise, you can climb there no matter how bad the weather. Several of the climbs have been done at night, during the worst of the December and January storms. Although the cave comes into it’s own as a place to climb in the winter, it does also remain relatively cool in summer and midges are rarely a problem. The approach takes around 20 minutes and crosses some boggy ground. Turn off the Road to the Isles into Arisaig Village and then turn left onto the B8008, signposted Rhu. After 1.6 miles, park next to a farmers gate at the back of an open bay, taking care not to block the gate. The drive takes around an hour from Fort William. Cross the gate and follow a feint path across fields, aiming for a holly tree on the skyline. Just beyond this, cross a stile beside the lochan and continue on a better defined path over the brow of the hill. You’ll now see the attractive pebble beach of Camas Leathann on the other side of the peninsula. The path leads down to the right edge of this (looking out to sea). The cave is 100m right (west) of the end of the pebble beach. scramble round some rocks at the right end of the beach and you’ll come across the obvious triangular entrance of the cave. You don’t see it until you are right on it. The ‘landung’ is flat and consists of dry sheep poo. Once you get over this, it’s no problem and totally dry. But for those who like a clean boulder mat, take a tarp with you. 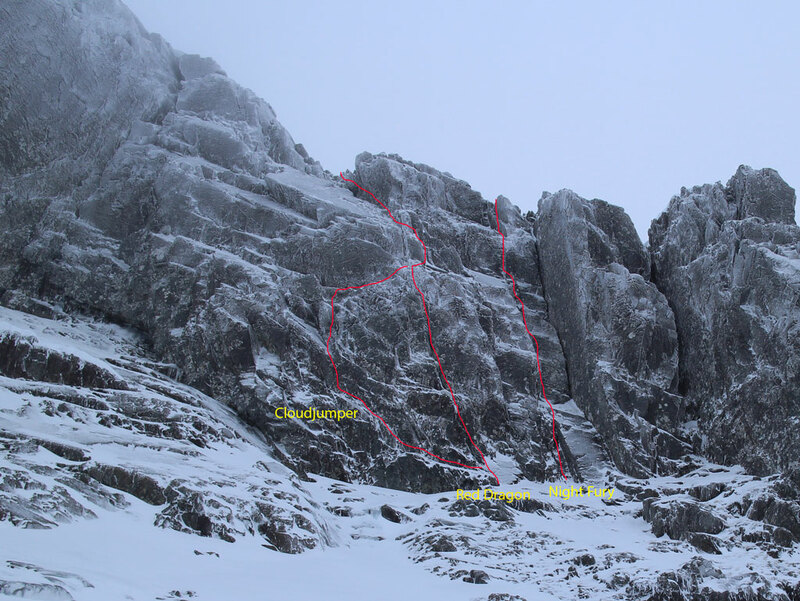 The problems are described roughly left to right, starting with the leaning arete of the steep side. 1. West Wall Arete 6B. 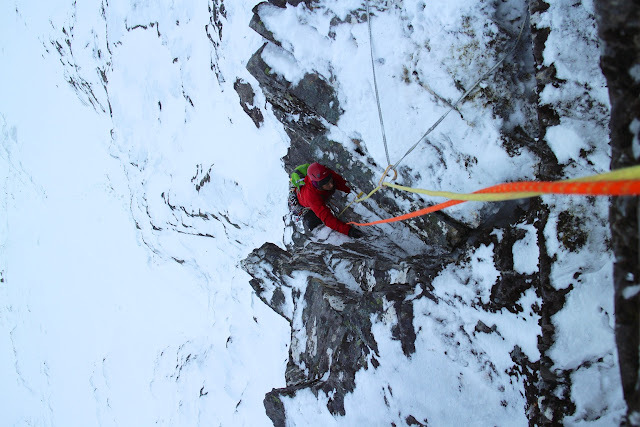 Sit Start and layback up the edge of the steep arete, pulling over on jugs. Step left and down climb the buggy slab to descend. 2. All The Small Things 8A. SS at the arete, at an undercut spike. 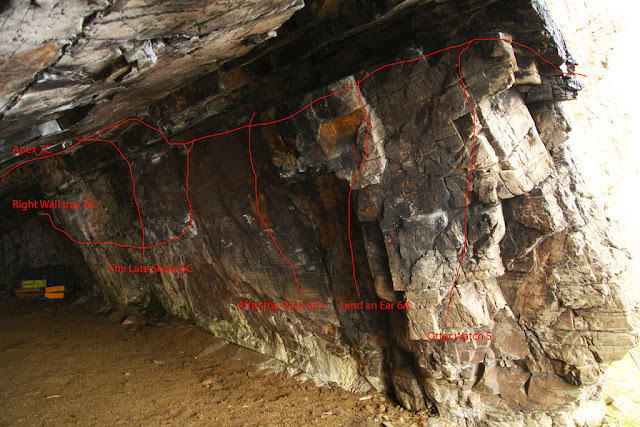 Follow the obvious line of holds leading rightwards into the cave, finishing up Bone Broke, at the jug/hole in the apex. Sustained and superb climbing. 3. At Eternity’s Gate 8A+/8B. Follow All The Small Things along the line of holds but then reverse the first few moves of The Original and keep traversing right to a welcome but strenuous kneebar rest at a triangular hole. Continue right, avoiding the blocks coming out of the ground. Using tiny holds, gain a heel hook on the ramp of Barista School (crux). Once established on this, shake out at the jugs (bat-hang possible) and finish along Fruit Machine, hopefully without blowing it right at the end! Originally given 8B but that was before the kneebar was found (after the original resting jug broke off). So it may or may not only be 8A+ now? 4. Good Drying. 8A+. Eternity’s Gate into Cowspiracy. 5. Project 8C. Eternity’s Gate into 4th Wave. A very demanding piece of climbing. 6. Triangulation Stand 7A. Right of the arete is a thin crack. Start using a finger lock in this and protruding crimp. Powerful drop-knee moves lead to jugs over the lip. 7. 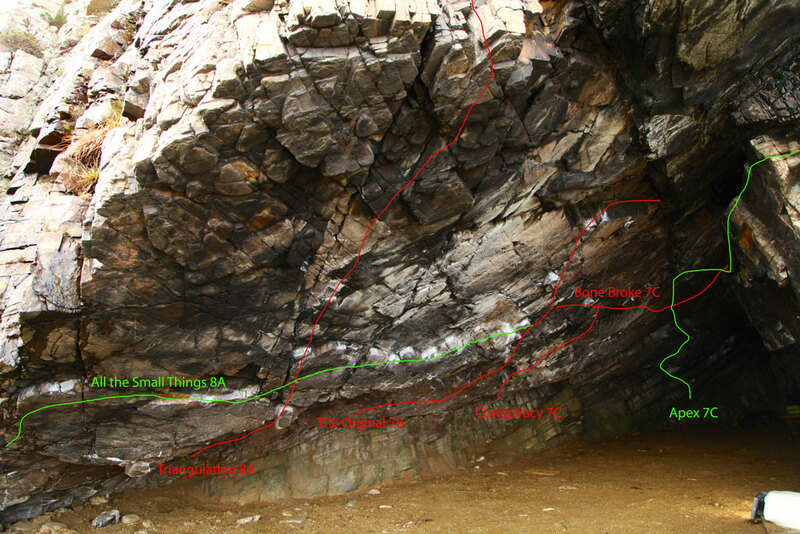 Triangulation 8A. SS away down in the very base of the low cave below the crack, at an undercut and gaston. hard moves lead to the base of the crack, but the crux is gaining the finger lock of the stand start. Fortunately there are a couple of different methods to choose from. 8. The Original 7B. Locate a two-handed, sharp edged undercut at the back of the cave, feet on the steep wall underneath. undercut outwards to the good edge on the ramp feature and continue directly, past a huge sidepull, finishing on edges in the crack in the apex. 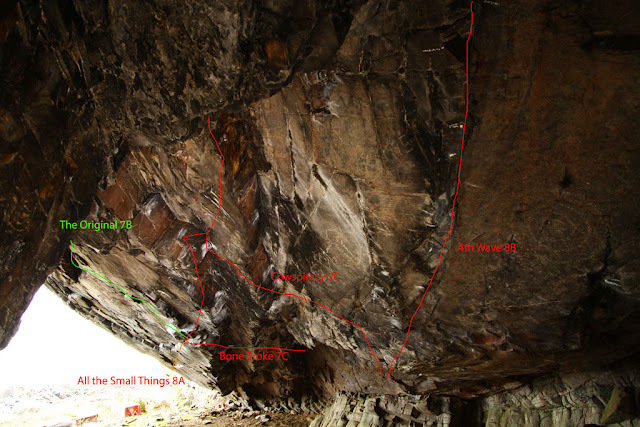 An extended finish continuing out of the cave on the apex crack has not been done yet (probably 7B+ or 7C). A classic problem. 9. Bone Broke 7C. Extends the fun even more. Follow The Original most of the way, then go rightwards to gain the next undercut wave feature. Undercut this rightwards to a finish on a big jug/hole at the cave apex. 10. Cowspiracy 7C. SS below the kneebar hole. Climb direct with a tricky move to gain a weird finger lock slot. Use this to reach into the finishing moves of Bone Broke. 11. 4th Wave 8B. SS below the kneebar hole. Follow the undercut wave feature with technical and powerful weirdness, finishing on twin edges right up at the apex. 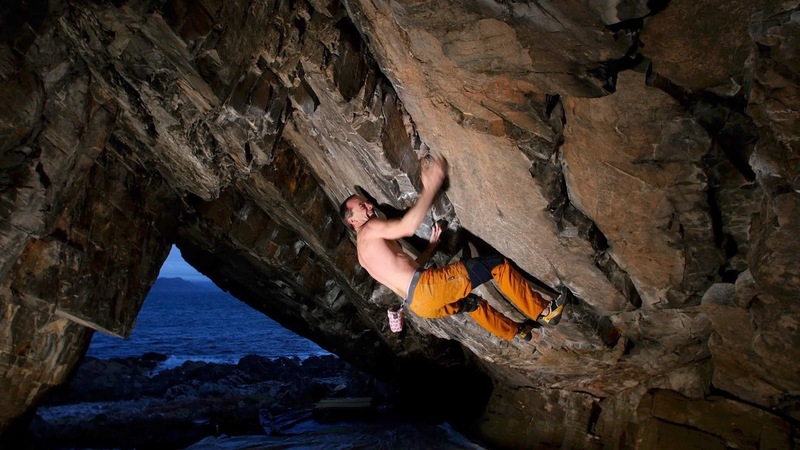 Superb technical climbing. 12. 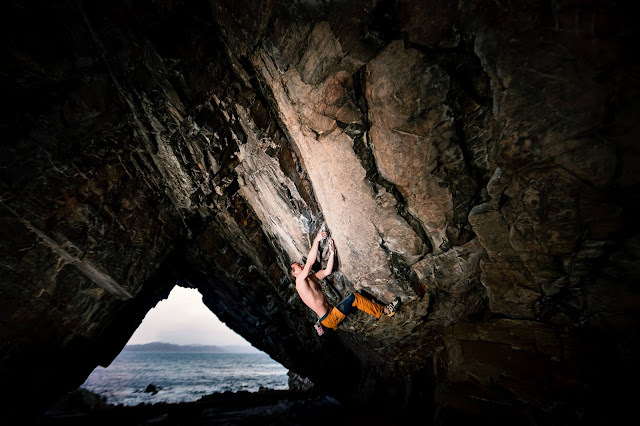 Fruit Machine 7B+. Start along the jugs as for Barista School but drop down and shuffle along the good undercuts to where they run out. Reach right for a good wobbly slot and then make a technical sequence to reach across the apex to finish on the big rounded nose on the other side. 13. Barista School 6A+. Start at the base of the huge jug-rail. Layback up this until it’s possible to rock over to spiky undercuts directly above. Slot the good kneebar in, and finish matching the twin slopers above, near the apex. 14. Barista School RH start 6B+. Start right of the jug rail, on the good undercuts. Reach a nice incut crimp above and lock this out to get the edge of the ramp, then the jugs, and a finish up Barista School. 15. Half Apex 7A. SS at the back of the cave at a poor triangular pinch. Make a tricky move up then go hard left, reversing the first part of Fruit Machine. Finish up Barista School. 16. Apex 7C. Start as for Half Apex. Use that good kneebar to rest, and instead of jumping down, continue on the apex and make tricky moves to gain the jug/hole at the end of Bone Broke. From here, use undercuts to drop down onto the Right Wall Traverse and finish along this. Epic! 17. Right Wall Traverse 7C. Start at the big rounded nose at the back of the cave and traverse the less steep side all the way to the slab outside the cave. 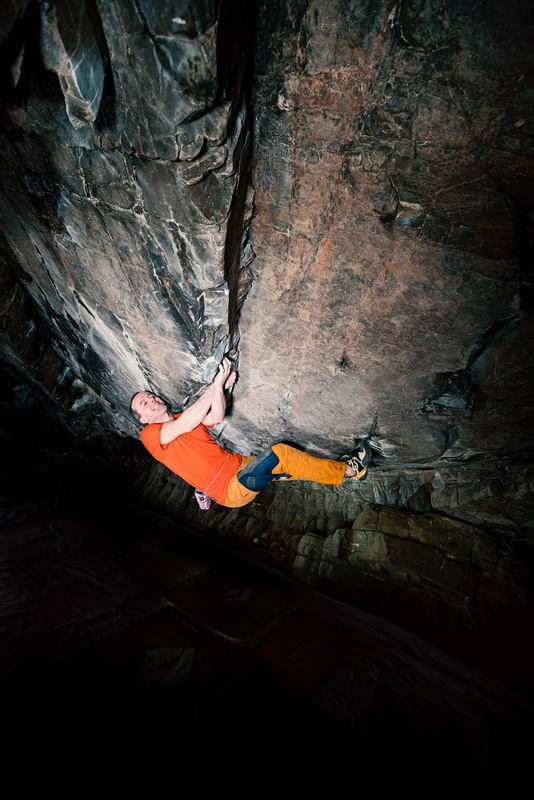 The first few metres are the crux, powerful and technical on low crimpy sidepulls. 18. The Late Show 6C. Start easily up undercut jugs mid-way along the cave. Reach an L-shaped hold, match it and make a tricky press move to get the jug/hole at the end of Bone Broke. The last two moves are deceptively tricky. 19. After the Race 6A+. Further right is a groove with a shield of rock above. Start on flat holds on the left side of the groove and climb up and round the left side of the shield. Finish on the sloper rail. 20. Lend an Ear 6A. Climb the Groove and swing round the right side of the shield using a spiky sidepull. 6A+ if you continue rightwards and exit the cave. 21. Otter Watch 5. From a low start climb the featured wall just left of the arete of the cave and swing round onto the slab. Various eliminates possible as a warm-up for the harder things. Dave MacLeod on "All The Small Things" font 8a, Arisaig from peter murray on Vimeo. Two days on my project in the cave this week, in the company of Chris Prescott, Natalie Berry and Kevin Woods. On the first day it was still a bit warm and I was feeling pathetic on the climb. I was full of thoughts and chat about sacking it for the season. Maybe it has to be mid-winter for this project? An hour later, a couple of blasts of wind came soon before my second redpoint of the day, and next thing I got three moves further. Maybe I should not be so hasty to call it. After a rest day we were back, with a cold front having passed over. Yet the day started off very badly and still I struggled. There are a couple of themes I have noticed in the cave. I always seem to do better on this project late in the session, when my skin is getting thin. I’m not certain why. It may be something to do with the smooth rock. It gets a bit ‘glassy’ if skin is too thick. Also, I’m noticing I consistently have good attempts just before dusk, when of course the temperature is dropping. It could be both factors working together. I went back to my sequence and wrestled with one adjustment move for over an hour. Finally I sussed what I was doing wrong - getting a weird undercut-wrap hold a finger width too far right. I still wasn’t feeling like there was really much point in a redpoint. But I rested and prepped anyway. And began. The first part to the kneebar was not bad (but not as error-free as I’ve done it). I felt quite rested on the knee bar. As much as you can be while hanging upside down trying to breath as lightly as you can without sliding out and landing on yer heid. But despite a fluffed move on the opening moves of 4th Wave I found myself beyond my highpoint and feeling like I still had some power. So I used it! I did not intend to do so, but spontaneously had a power-scream match with the crux that Adam Ondra would be proud of. I momentarily had that weird floaty feeling where it just seemed to be happening by itself. I threw for the final hard move, held it, cut loose, held on but then started to drop. If I’d held on long enough to get my feet back on, I’d very likely have done it. But I didn’t. I cannot decide if in that split second I truly held on to the last, or if I might have decided a few milliseconds too early that I was off. It doesn’t matter much now anyway, except that I know what I need to do if I get back to that move again. highpoint March 3rd from Dave MacLeod on Vimeo. The video above is my best effort so far on the project, from a couple of sessions ago when conditions were quite good. Still tired from a new mixed route 48 hours before. Humid conditions. Skin too thick. Not enough sleep. New boots I hadn’t tried before or broken in. Too weak. Too heavy. Too many days away from the training board. Still, I learned a lot, so the time was not wasted. I have been here before on many projects. None as hard as this, but the stages are often similar. Often, at least at my age, the lessons are not really new things you didn’t know, but crucial reminders of things that are easy to forget. The first thing reminder was how important the small details are. My ankle must have been a tiny bit stiff from winter climbing a couple of days before. Who knows how little, but it can’t have been as much as a 5 degree loss of dorsiflexion. Not even enough to notice during walking or any moves apart from one. Normally it is a squeeze for me to fit my knee into the kneebar rest before 4th Wave. Today I just couldn’t get the knee in at all. What is normally a straightforward move just didn’t happen. So, redpoints were out. Given the above list of excuses, I realised pretty quickly that it would be a session of reflection on the details of the moves, and reflection on the bigger picture of my progress in general. On days such as this of utter failure, at least by the measure of how many moves are linked, you see clearly the overwhelming probability that you will never be able to climb this project. It is too hard for you. Something has to be. It would be a bit ridiculous to have chronically underestimated my climbing abilities for over 20 years! At some point, you won’t be able to do something. This holds no sense of disappointment or stress for me - it’s just inevitable. But the value it does hold is that it sharpens the mind to search for the next level of intervention. What is the next move in the game? Some moves have trade-offs. Do I leave the project for a week or two and do more training, or keep going on it? Not 100% sure. I am almost certainly getting weaker without training on the board. Yet despite knowing it quite well now, I could still flow through the opening section more efficiently. And that comes from lots of time on it. I have some equipment issues to sort out. Tomorrow I try out a different kneepad, the original homemade one I made for Echo Wall. It might help a little with sliding the knee in. I know that I need to work more on my core strength for the two minutes of stress hanging upside down off those kneebars. At the moment, it’s a straight trade off between sliding out of the kneebar, and breathing. I need to be able to do both. - I need a more solid warm up routine for my sessions there. I think I might try ‘add-on’ from the start of the project. - I’m more and more aware of the nuance of conditions in there. I need to take more advantage of good weather days. The cave has okay conditions most of the time, which is fine for working moves. At this stage, I need good conditions now. - I need more rest, better rest. Less work. - I have some work days coming up. I need to combine them with some intense circuit training. Most of the above is all small but important details. What of big things. Well, most of these I have sorted. But I still have a big hand to play regarding the king of all variables for me; strength: weight ratio. I will play it soon. Towards the end of February, Scotland kicks off with good conditions for just about everything at the same time. It’s important to be organised to capitalise on it. I have not been this year. 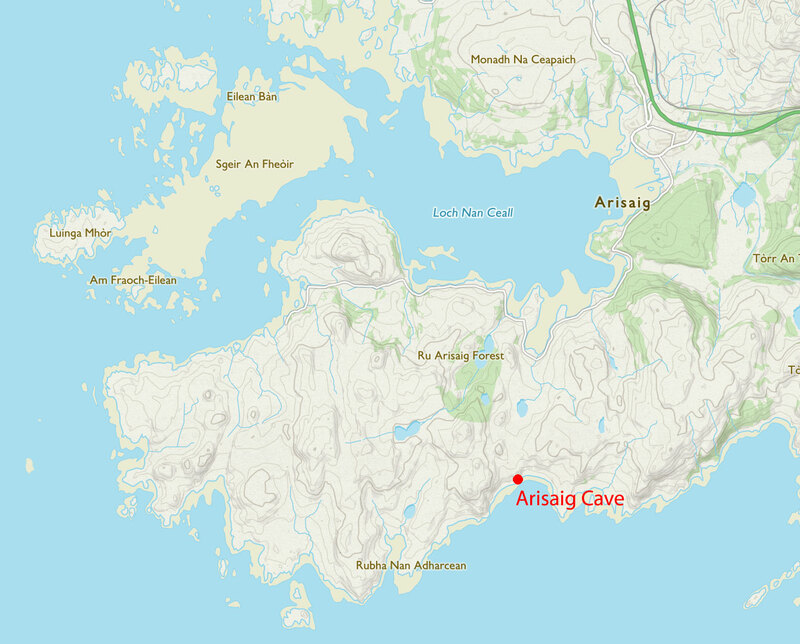 My efforts in the Arisaig Cave have been paying off with excellent progress on my project there. I have now got to the start of the crux section and got good overlapping halves, after several hard training sessions and hard sessions on the project. So the climbing part has been going great. The trouble is that sessions on it do leave me feeling pretty wasted, with a lot of recovery to do. I realise that these sessions necessitate extra sleep to recover from them properly. I go home, eat dinner, it’s 9 or 10pm and I still have a lot of work to do. I try to work until 11pm, but I never get enough done and it runs to midnight or sometimes after. This is okay if you can catch up the next morning (I am a night owl and this pattern suits me well), but it’s not always possible. 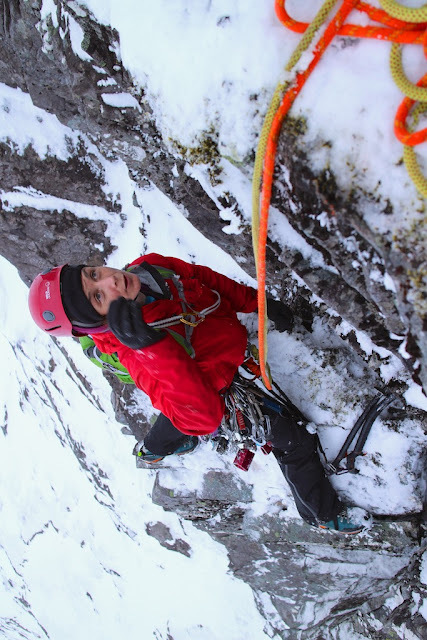 Later last week I had a bit of a sleep deprivation meltdown the night before going onto the Ben to try a new route. Every muscle in my body ached from the previous five days of bouldering at my limit. I was worried I would not be ready for the effort of trying a hard new route. But a frantic run around trying to get everything in order was enough to see me walking up the Ben on Sunday morning with Helen, feeling okay. I did welcome a stop for tea in the hut though. We had been thinking of some objectives in Coire na Ciste, but the Ben was looking very spring-like, with the steeper cliffs looking black. So we were forced to explore the upper reaches of Observatory Gully, near my own route Echo Wall. Our new routes on this part of Tower Ridge. The Great Chimney can be seen on the right side of the shot. Echo Wall is out of sight to the left. 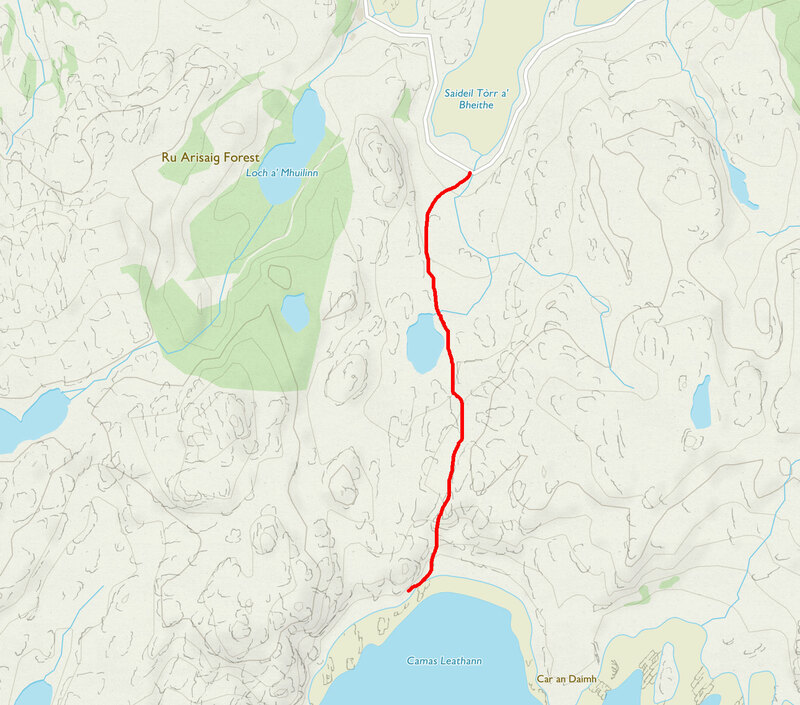 Myself and Helen have done a string of new routes here, partly because it’s a great area and partly because it’s often white when just about everything else isn’t. Right of Echo Wall, Helen and I added an VIII,9 and an IX,9 already, but I was also interested in the complex walls to the left. There was clearly something good to be done, but hard to see exactly where with a myriad of overhangs and grooves and no obvious cracks to lead you. After one false start, I headed up left along a technical ramp. I passed a curious in-situ peg with a krab on it, and further up came across another, and a wire, both with krabs on them. A previous highpoint from someone else? I spotted another in-situ piece in the next groove to the left, but I wanted to tackle the cracked overhang directly above my head. As usual with winter, my first couple of forays made me think it was not going to go. I could see why the climber before me had opted to go left again. But soon I figured out some hooks to get to the lip of the overhang. Heart in mouth, I reached over, hoping for something good. My pick found a solid hook, but as I weighted it, a block moved. I hung down on the tool below and wondered what to do. It was either bail, or pull the block off and instantly whack it to the side before in hit me square in the face. This worked perfectly (it had to!) and I struggled over and up to a great ledge with options to go left or right. Right looked more possible, and I was tired, so after Helen joined me, I set off on what turned out to be a few teetery moves before gaining the final pitch of our previous route Red Dragon. I topped out on Tower Ridge just in time to catch the sunset and reflect on another great new line on a part of the Ben I am getting to know quite well. We later found out that the route had two previous attempts from the same team, skirting the crux overhang on the left but retreating from higher up. On my belay sessions, I resolved to return here in summer as well as winter and climb more of the great things here that wait to be done. Nice moment to top out.